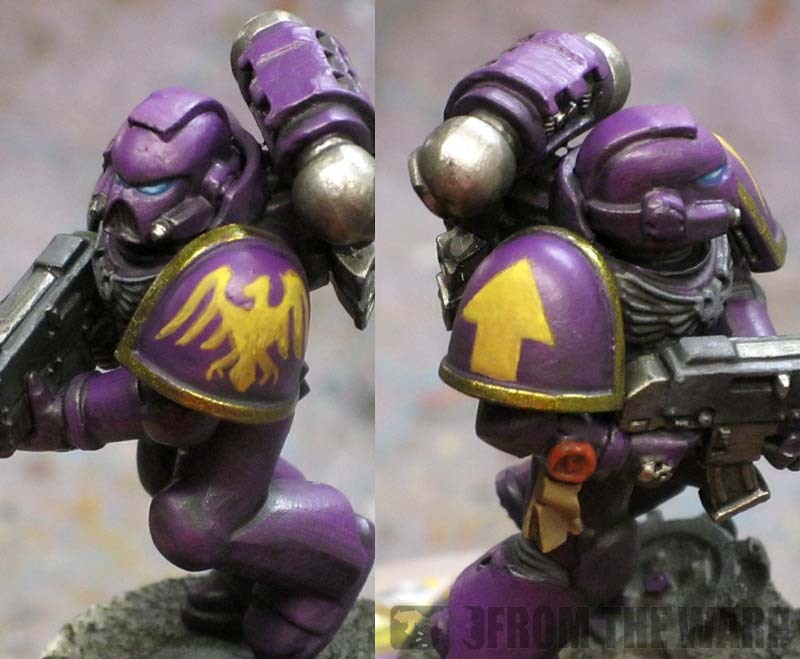 A few weeks ago, I got an email from someone asking about a process to paint Hawk Lord Space marines. He'd seen the work I'd done for a DIY chapter for a friend of mine and was wondering if I could paint up a Hawk Lord and go through the process. There's actually three smaller tutorials in this post. 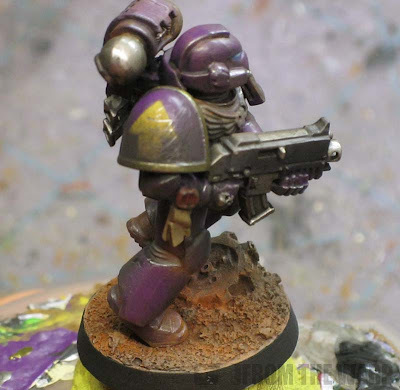 How to get a basic tabletop look, how to get the look seen above with all the weathering in place and then when to stop so you get the same model as above without all the weathering. The time difference between the two methods is about the same since I tend to paint fast and loose for myself and much better for others. It all comes down to what look you prefer on your own models. I have to say that I took this as an opportunity to try out the same weathering I did on the Black Dragon Space Marine again. I wanted to see if I could get similar results with a different color and not just over a black basecoat. 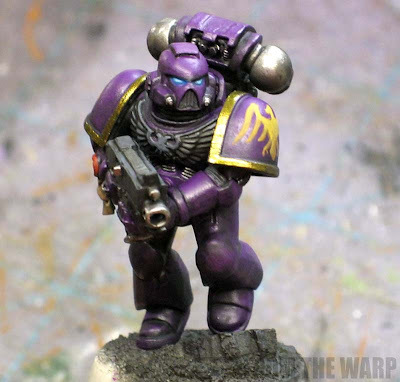 This is the DIY Space Marine chapter I've been working on, so I'm going to use him as the tabletop example. This is a very simple technique and relies on line highlighting to accomplish the effect. 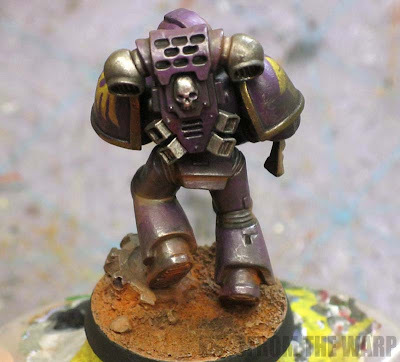 I started by priming him black and then applying a coat of P3 Beaten Purple as the base for his armour. The purple is slightly transparent so it takes two coats to get good coverage. After that, it's a wash of GW Leviathan Purple in the recessed areas only followed by a quick line highlight of Americana Vivid Violet. That's it, all done on the armour. You add the rest of the elements as needed for the particular model. Some people might argue that I kill the look of a model with the weathering I do. They might be right. It all comes down to what you want your guys to look like. That's why I decided to show the before and after when it comes to the weathering on this model. It starts the same way as the tabletop version does. 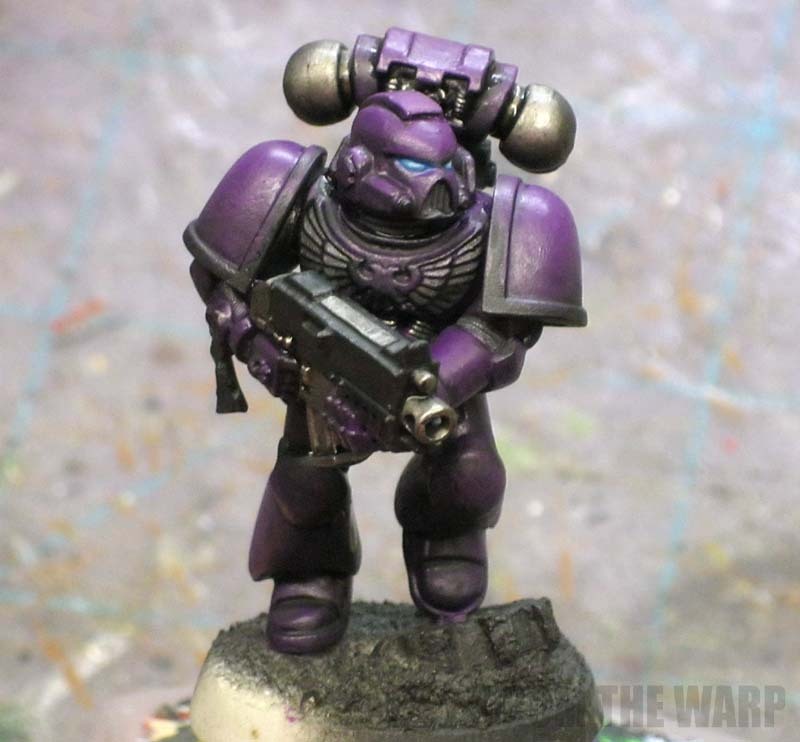 A quick layer of the P3 Beaten Purple. This time though, I'm not too worried about complete coverage since I'm going to be doing a few more things to it. I should back up and say I painted the eyes first since they are recessed. It's a basecoat of GW Hawk Turquoise for the whole eye with a bit of white added to the turquoise again for just the center portion. For another method to paint Space Marine helmet lenses, check out this post. This guy is going to be a bit darker than the previous tabletop version. That and I don't want to spend much time line highlighting him. After the basecoat dries, the whole model is given a liberal wash of GW Leviathan Purple. After that dries, take the Beaten Purple color and go over the upper portions of the model. Top of the shoulderpads, top of the helmet, etc. Any place where and overhead light source would hit the surface of the armour. Think of it as zenithal highlighting. It will take a couple passes to get the color up to the pure bottle color, but that's ok, this is the "highlighting" for the model. You don't have to be perfect either. The dark purple and the pure purple are very close and you don't really have to worry about perfect blends. Once that's all dry, take your black paint and cut in all the areas you need to that shouldn't be purple. Mostly the metallic areas. You can even paint those GW Boltgun metal before the next step to save some time. Now go over just the recessed areas of the armour with GW Badab Black to push the shadows. If you painted your metallics ahead of time, you can wash over them as well. A quick note on the flex fitting between the armour. I cheat here and use GW Foundation Adeptus Battlegrey as my basecoat and hit it with a Badab Black wash to bring out the detail. It's a very quick process that gives me what I think are good, muted armour joints that don't detract from the model or draw attention like metal ones can do sometimes. And here's what he should look like at this point. I'd forgotten to paint his chest eagle black because I thought it was gold like the trim on his shoulderpads. Good thing I looked up some reference on this guy before painting it gold. Since the painting on this guy is fairly loose, I knew I could trick viewers into thinking it was more by adding some nice freehand to his shoulderpads. Not much, just enough to make you think the rest of him is painted to the same high standard. Don't believe me, take the quiz and see how it works. I knew I did not want to try and replicate the Hawk Lord chapter symbol and tactical squad arrow in gold paint. I decided to use two GW Foundation colors to do the freehand. The base is Calthan Brown and the highlight is Iyaden Darksun. When it comes to adding freehand, there are few things you need to consider. 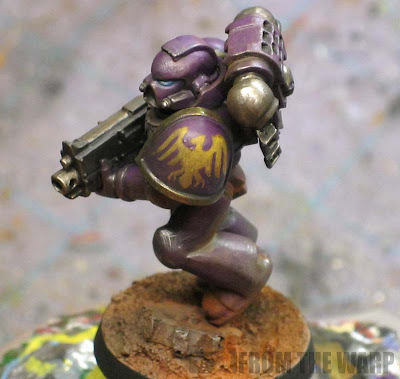 I talk in depth about those issues in this post here about when to add freehand to your models. 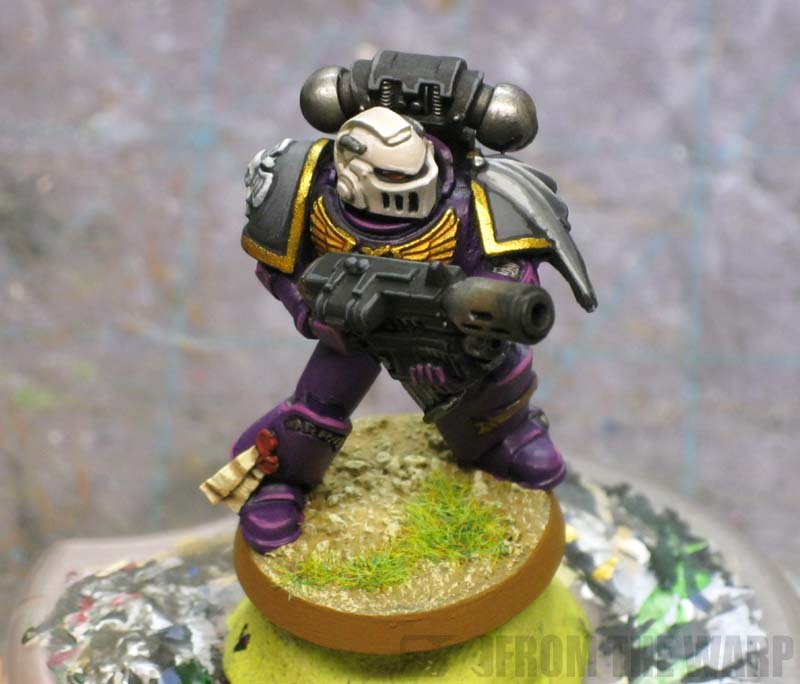 Last but not least is the gold trim on his shoulderpads. I went with P3 Blighted Gold for this guy. After that, it's a matter of painting up the last few things on him like his bolter, any purity seals and little things like that using whatever formulas you prefer. I went over his black chest eagle with the same grey I used for the flex fitting. A few highlights across the top portion to make it stand out was all I did. And this is where you'd quit if you wanted the "cleaner" look without all the weathering. Just finish off the base to match your force and call it a day. Nothing wrong with this guy at all. So how did I weather this guy to make him fit his environment? I only used a couple of quick things to give him the war-torn look like he's been fighting for a week straight without a break. I have Secret Weapon powders and use them for all my powder weathering along with a couple other techniques. The first thing was a quick pass with the metallic weathering powder over the lower portion of his legs to simulate the wear and tear of the paint. That was followed up with a pencil for some edge weathering all over the model. After that, I used a black weathering powder to darken his exhaust vents on his backpack and mute the lower portions of the iconography on his shoulders. The final step was to paint the base using GW Foundation Charadon Granite and then cover it with a few red and brown powders once dry. I carried those reds up into the lower portions of his armour to show the dust that had accumulated on his armour and in the joints. So whether you go for the quick and effective tabletop results or you go for the full weathered approach, it's not too hard to get a good looking Hawk Lord. The color scheme is a nice one and they look pretty sharp on the tabletop. One of your best works in my oppinion- thx for the explanations! Very good step-by-step. It will be helpful in the future! Cannonfodder: Thanks. I don't know if he's my best, but he taught me a few things when it comes to refining my painting style. Now I want to try something else and maybe a different color. Can I make a tutorial request? 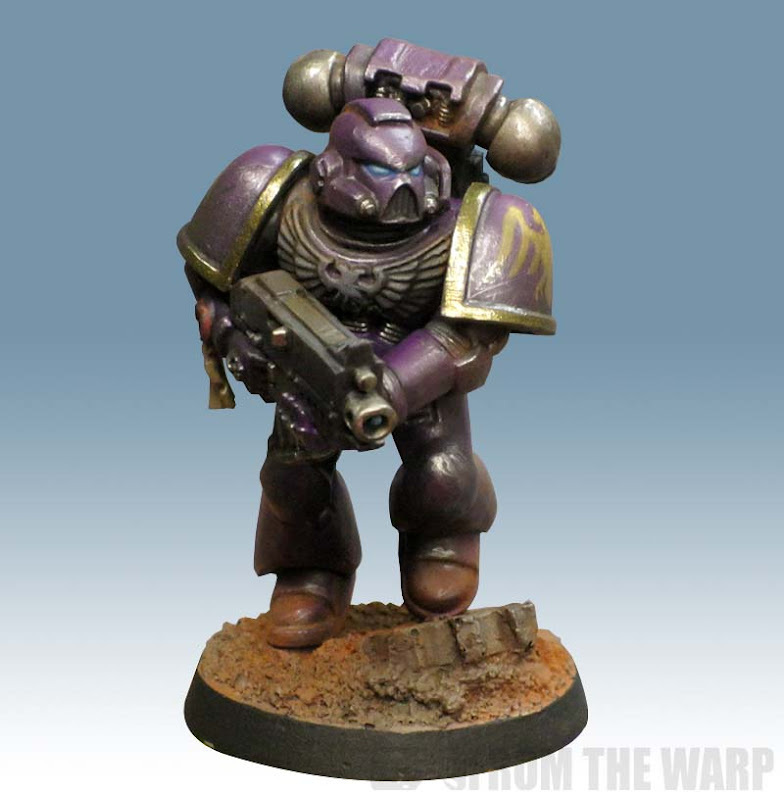 I'll really appreciate if you could give some"white-white" marine tutorial. Of course I saw your deathwing bone tutorial, but I'll need some more...white. Khorneguy: Ah, didn't think of them. It would work just as well for those guys as well. Good catch. Anon: Like White Scars white? 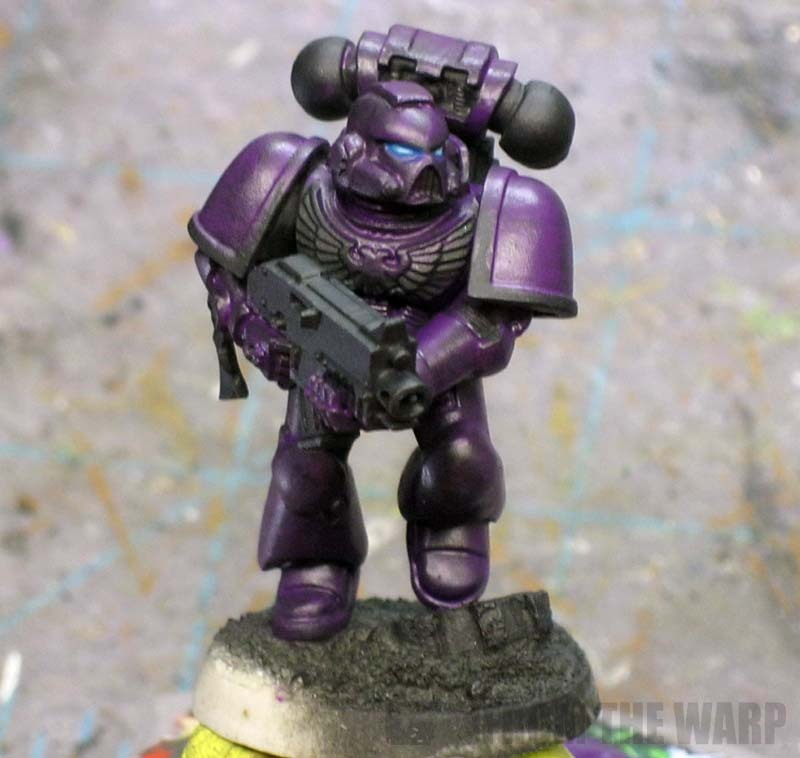 I should have labeled the post how to paint purple... might have been a bit more appropriate in the end. Yes! pure white, like White Scar. I'm trying Luna Wolves, but what's the difference, lol. Anon: Let me see what I can do. There are a few things to remember when it comes to working with white. I'll get a post together in the coming couple of weeks. I'm using nearly the exact same scheme for my homebrew chapter myself. Beaten Purple as well, instead of using leviathan for my wash, I use Payne's Grey. A blue-black color. it gives a really good shadow in my opinion. Your skills have really been elevated, sir. Longscope: Interesting. It all comes down to what you want your model to look like in the end. There are so many small things you can adjust to get a slightly different look. Mr. Esty: Thank you Sir. I still have a bit of work to do when it comes to refining, but I'm getting there.